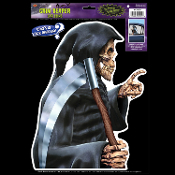 Cloaked Grim Reaper Skeleton with Sickle Sythe Backseat Driver Car Static Vinyl Cling. Fun for Halloween or anytime. Clings to glass and mirrors. This hilariously funny and realistic skeleton angel of death static car window cling image of a near life-size profile skeleton skull reaper pointing the way to the afterlife, will give your backseat the appearance of having a ghostly occupant... This spooky conversation piece gets plenty of attention! Each figure image measures approx. 14.5-inch high x 11-inch wide (36.25cm x 27.5cm). ***Please Note: Item will be shipped rolled up in a cardboard tube, and may need to be laid flat for a few days to straighten back out .